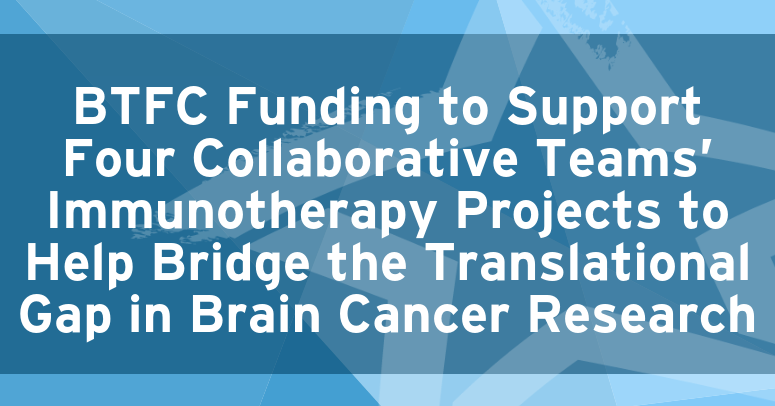 The Brain Tumor Funders’ Collaborative (BTFC) today announced $3 million in grants to four multi-institutional teams studying immunotherapy in primary brain tumors. The Pediatric Brain Tumor Foundation (PBTF) is honored to be one of the BTFC’s six funders on this initiative. The projects funded by the BTFC will examine vaccination strategies, the tumor’s micro-environment, anti-tumor T-cells, and personalized immunotherapy approaches. They were selected during a multi-stage review process from more than 79 responses to the BTFC’s call for proposals. The PBTF is participating in the BTFC as part of our recently announced Immunotherapy Research Initiative, a large-scale investment in immunotherapy projects that will generate new discoveries in the study of pediatric brain tumors and inform future research in the field. Partnering with the other members of the BTFC presents a remarkable and rare opportunity to multiply the impact of the PBTF’s funding and foster productive collaborations between researchers studying brain tumors in adults and children. “The world of pediatric brain tumor research has many discoveries to uncover and paradigms to shift before the promise of immunotherapy for children and teens with brain tumors is realized. The PBTF is committed to solidifying the needed efforts through a variety of funding mechanisms, including co-funding partnerships like this one with the BTFC,” says Dr. Joanne Salcido, Vice President of Research and Advocacy at the PBTF. Among the selected research projects is one specifically focused on pediatric brain tumor research, which will explore the use of anti-tumor T-Cells in adoptive cell transfer immunotherapy for pediatric high-grade gliomas. “The impact of the pediatric brain tumor-focused research project on adoptive cell therapy will undoubtedly be maximized by leveraging the broad brain tumor expertise and multi-disciplinary scientific and medical collaborations intrinsic to this BTFC-funded initiative,” adds Dr. Salcido. The Brain Tumor Funders Collaborative was formed by private foundations and non-profit organizations to pool their resources and become more strategic by focusing their research dollars toward specific therapeutic goals. The BTFC organizations combine this research funding with patient education and advocacy. Further information about the BTFC and its funding initiative can be found at www.braintumorfunders.org.